At the last DTWC meeting at the Greybush Manor hosted by The Greybush himself, the choice whisky for the evening was a bottle of 1995 Lagavulin Distillers Edition, finished in Pedro Ximenez sherry casks and bottled in 2011. In choosing a whisky for the auspicious occasion I wanted to get something that the club members had possibly not tried. Searching in the usual haunts did not produce anything special that we had not tried. The next step was then to engage someone who was more experienced in these matters. I contacted the Baron, who, though young in years (compared to me) has a vast knowledge of all things good in a malt whisky. We called upon the resources of the internet and soon were browsing web sites from England, where the availability of exotic whiskies is large. 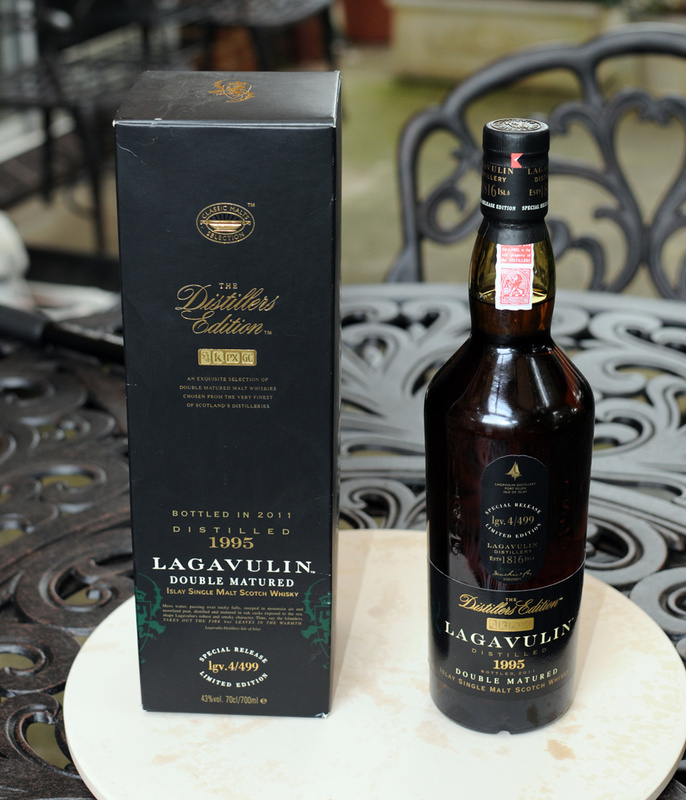 In our search we came across the Lagavulin range, a few of which I had tried before and must admit were very smooth to drink. I have a love of peated whiskies (Laphroaig Cask Strength is my favourite) so when we spotted the blurb for the Lagavulin DE Limited Edition, I knew this was the one. What intrigued me was the fact that this 16 year old was finished in Pedro Ximenez desert sherry casks. I figured that not too many (if any) of the members would have had a chance of trying this whisky, so I would be bringing something new to the table. The bottle was duly purchased and arrived in Sydney in just over a week. Then the doubt set in - maybe this whisky was going to be too sweet! On the night the whisky was well liked by all. Although it was sweeter than most other whiskies we have tried, it was not over the top. When poured into a glass, it has a beautiful golden brown colour. It smells smoky and woody, with a hint of iodine and sweet wood, pulling its sweetness from the sherry casks. The whisky has good legs when heated in the hands and swirled around the glass. The finish was quite strong and lasting. I found it very pleasing on the palate and could have quite easily settled back in front of an open fire place with the rest of the bottle. I'm not sure this whisky is readily available in Sydney but will certainly include it in any future shopping list when purchasing overseas.